The Bach is a simple, basic Kiwi bach (small cottage). The Bach is sound, clean, sunny and peaceful. It is self-catering with all cooking utensils, crockery, cutlery, pots etc. available for guests to prepare their own meals. 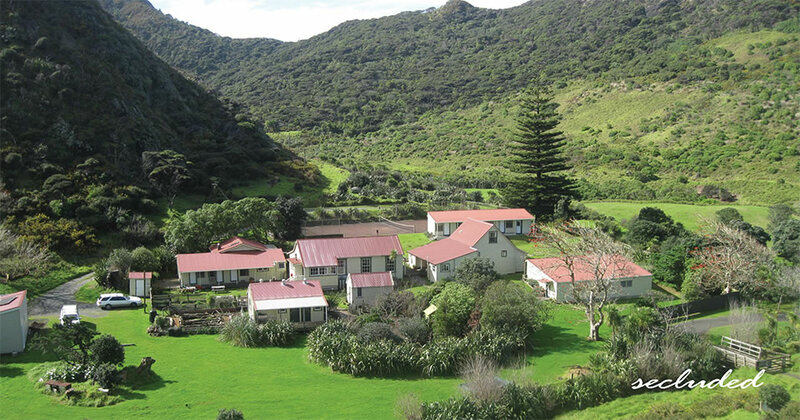 When you book the bach you do not have access to the Whatipū Lodge grounds or facilities. Due to waste water management the bach is restricted to a maximum booking of 8 people. There are three bedrooms, with a king bed, double bed and double bed with single bunk above. A pull out sofa bed is in the living room. The bach sleeps 8. There is a very clean and modern bathroom (toilet, shower and basin), roomy sitting room and kitchen (gas oven, cooktop, gas fridge with a small freezer cabinet). Guests need to bring sheets and duvets/blankets or sleeping bags. Pillows and pillowcases, bathmats and hand towels are supplied, as are tea towels and dishwashing/cleaning supplies. Hot water bottles are needed for cold winter nights. Guests should also bring torches, insect repellent, sunblock in summer and suitable clothing/footwear for hot black sand and changeable weather. In winter gumboots are a great idea. Electricity | Whatipū does not have mains power. The lights run on 12V solar power. The stove, fridge and hot water run on bottled gas. There are no power points. Please ask at the Lodge office if you need something charged. In winter a gas bottle heater is made available. Water | We provide 10ltr containers of city supply drinking water. The bach's water is piped from further up in the hills. The water is not filtered and does become discoloured after heavy rain. Telephone | Coverage is patchy. There is coverage at Whatipū Beach. Rubbish Disposal | To help us maintain this unique environment please take all your rubbish home as we do not have a recycling service at Whatipū. Hillary Trail walkers staying one night are welcome to leave rubbish behind. First Aid | Please bring your own First Aid Kit. A small kit is supplied in the Bach kitchen pantry cupboard. The Lodge management is trained in First Aid and we have a comprehensive First Aid Kit. At the Lodge we also have a self-explanatory defibrillator in the event of a heart attack. Please report any use of First Aid materials so they may be replaced. Dogs | Whatipū is a Scientific Reserve and dogs are banned from the beach and wetland. For this reason there is a ‘No Dogs’ policy at the Lodge, Bach and Campground, which is strictly enforced. No Pets. Arrival and Departure | Guests are generally welcome to arrive about 2pm and depart at midday. If there are no other bookings, I will advise if you can arrive earlier or depart later. There may be occasions when arrival and departure times may have to alter to fit around other bookings.